Ken Shaw Toyota is also happy to offer you a wide range of tires for cars, SUVs and small trucks in Toronto at our dealership. We feature a wide-ranging choice of the finest brands, highly competitive pricing, and the expertise to help you choose the perfect products for your needs. 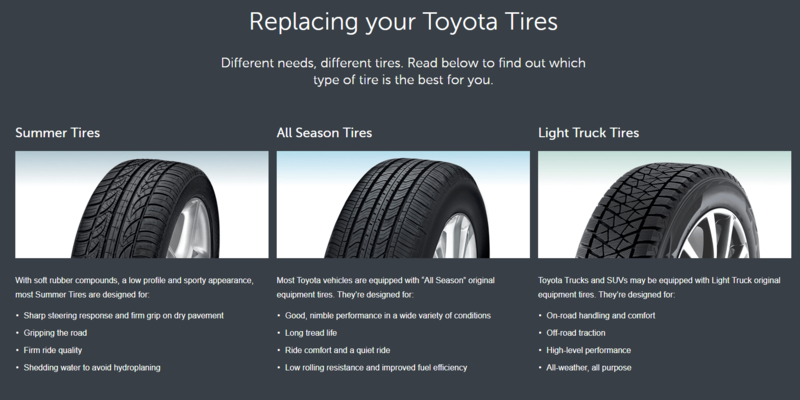 Read below to find out more about Replacing Your Tires and Search for them in our Tire Wizard below. Winter Tires are designed to perform optimally in both snowy conditions and cold temperatures, providing the performance and safety you expect. In fact, they’re recommended as soon as average daily temperatures drop below 7°C.